As one of the best-managed steel mills around, here’s why you should have it in your portfolio...forever. Nucor Corporation (NYSE:NUE) is one of the largest U.S. steel mills. It's also one of the most profitable today, in the midst of a deep industry downturn that's been in place since the end of the Great Recession. Sound impressive? Here are eight reasons to buy Nucor Corporation and never sell. So the first reason is really something that would apply to just about any steel mill, but it's important. Steel is one of the key foundations on which our modern society is built. It gets put in our buildings, our roads, our machines. Although aluminum has its benefits, it's unlikely that it will never replace steel. So, the first reason to own Nucor is the vital importance of what it creates. Making a vital product isn't enough to recommend a stock, though. But here's another notable fact: While Nucor lost money in 2009, the tail end of the recession, it has been profitable since. Competitor AK Steel (NYSE:AKS) has bled red ink every year since the recession, United States Steel (NYSE:X) has lost money in six of the last seven years, and ArcelorMittal's (NYSE:MT) bottom line has been in the red for the past four years. You can argue that each of these companies is heavily weighted toward blast furnaces (more on that later), but even Steel Dynamics (NASDAQ:STLD), which focuses on electric arc technology like Nucor uses, lost money last year while Nucor remained in the black. To put it another way, Nucor has shown a resilience that competitors simply haven't. NUE EPS Basic from Continuing Operations (Annual) data by YCharts. Then there's the money Nucor has to burn. At the end of the second quarter it had nearly $1.8 billion of cash. It also had an undrawn credit facility that doesn't expire until 2021 worth another $1.5 billion. U.S. Steel had a billion less cash at its disposal -- not a good thing when you're bleeding on the bottom line. AK Steel had just $56 million in cash as of the second quarter, showing just how hard this downturn has been on the company. I'm cherry-picking numbers, to some extent. But when you put Nucor up against some of the biggest names in the steel industry, it stands out financially, which gives it a lot of room to maneuver. Nucor's electric arc mills also make heavy use of scrap metal, which can help to keep costs in check. This is because the ability to use scrap provides an alternative to iron ore when commodity prices are high. Blast furnaces have to be fed iron ore, high prices or not. In addition to Nucor's use of more flexible facilities, it also has a more flexible relationship with its employees. This is because it uses a profit-sharing system that rewards employees during the good times, but asks them to feel some pain during the bad times. 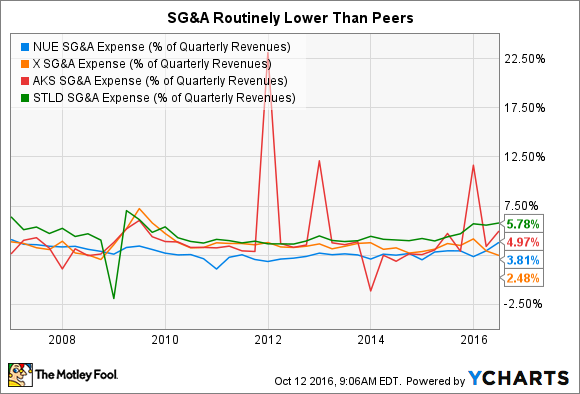 Take a look at the company's SG&A expenses over time, and you'll notice that Nucor is routinely at the bottom of the group, meaning it runs a leaner ship. Profit sharing is a big part of that. NUE SG&A Expense (% of Quarterly Revenues) data by YCharts. The next reason to buy Nucor is made possible by some of the items above, but that doesn't make it any less important. 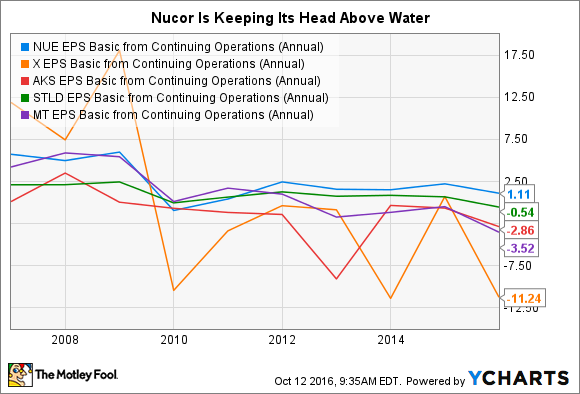 Nucor tends to invest during downturns so that it comes out the other side a stronger company. This can sound like management boilerplate, but it's more than that at Nucor. For example, the steel company has built two direct reduced iron (DRI) facilities during this downturn that will help it keep costs in check in the future. Neither facility got off to a good start, losing money at the get go as they worked the kinks out. And then iron ore prices fell, leading Nucor to buy iron ore on the open market instead of using its new facilities for a spell. That's not such a good thing, but they weren't built for today's market. The DRI plants offer a cheaper alternative to iron ore when commodity prices are high. So when the cyclical commodity market picks up, and commodity prices aren't as favorable, Nucor will have additional options for keeping its costs down. Long-term thinking like this is exactly what I like to see in my investments, even if the costs are higher over the short term. The last reason, if one more is needed, is all about investors getting what they deserve. In this case, that's dividends. Nucor has increased its dividend for 43 consecutive years. That's not just impressive within the steel industry (no other steel company here comes close to matching the streak), it's impressive for any industry. And this consistent return of value to shareholders is only possible because steel is so important to global commerce, Nucor has a solid balance sheet with low debt and plenty of cash, it has some of the best-run mills in the world making use of flexible technology and manned by flexible workers, and it uses this strength, and its ability to remain profitable during the most difficult times, to get better during downturns by investing in the future. You don't get to 43 years of annual dividend hikes on a fluke! If you looked at these eight reasons to buy Nucor and never sell and were shocked at how it stands out from the pack, you might want to consider making it a part of your core portfolio. It's a key part of mine.